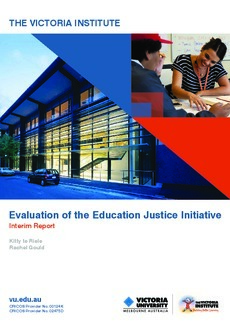 This report is the first stage of an evaluation of the Education Justice Initiative (EJI), as 12 month pilot project funded by the Department of Education and Training (DET) in August 2014 to address educational disadvantage among young people involved in the youth justice system. The initiative is managed by Parkville College; the school operating in all the Department of Health & Human Services (DHHS) secure services. The project included funding to support an independent evaluation. Parkville College has engaged researchers from the Victoria Institute for Education, Diversity and Lifelong Learning at Victoria University (VU) to conduct an independent evaluation of the Education Justice Initiative. The VU researchers work collaboratively with EJI staff. This Interim Report is based on only one component of the overall research: a dataset related to 38 young people who became full EJI clients in the five months between early September 2014 and early Febuary 2015.